← Shooting or Hunting from a Bicycle? Answer: According to DFG Deer Program Manager Craig Stowers, this picture is a great example of something I tell people all the time – deer don’t make very good neighbors. In addition to generally being a nuisance by eating, trampling and defecating on landscaping and gardens, deer can also be dangerous to human beings and other domestic animals (particularly dogs). It’s obvious from the photo that these bucks are not “friendly” and should be given a wide berth, but even younger, smaller deer are very strong and unpredictable and should never be approached in any way. There are a couple of times a year when there is an increased potential for a negative (especially for the human) encounter with a deer. The first is around late March to early June, when does have fawns in hiding or just at heel. The does are particularly protective of the fawns during this time period so do not approach any fawns or allow your dogs to do so. If a fawn is seen without a doe please do not assume the fawn is orphaned and needs rescue. The doe is undoubtedly in the area, most likely feeding or just waiting for you to leave the area so she can check back in on her fawn. The second time to be aware of is around mid-November to mid-January when bucks are in rut. During this time of the year bucks are continually on the move, fighting other bucks and looking for does to breed. They don’t even take time to eat during the rut – the urge to reproduce is overwhelming and not to be interfered with. The bucks in this photo are large and powerful animals with sharp antlers that can do a lot of damage to the human body. Even if you aren’t the target of the antlers, just getting caught up in a situation like this could be a very bad experience and is something to be avoided at all costs. Like all wildlife, deer are best observed at a distance. Don’t feed them or try to interfere with their behaviors in any way. 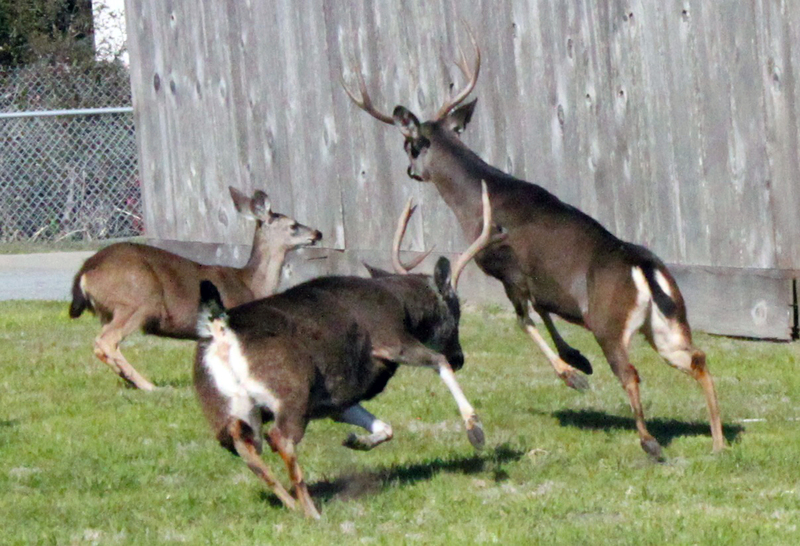 The photo represents an aspect of deer behavior that people should be aware of so they can act appropriately and avoid any negative interactions that could result. Although dramatic, I’m sure that most people (myself included) would prefer that the kind of “wildlife experience” shown in the photo not occur in my or my neighbors’ yard. Legal to keep female Dungeness crabs? Answer: Sport fisherman may keep the female Dungeness crab – commercial fishermen must throw them back. Since the females are often much smaller and less meaty than the males and lack the large claws, many fishermen toss them back so they can reproduce more young for future generations. The larger females that meet the minimum size requirements also carry the most eggs and produce the most offspring, so it’s beneficial for the population to let the females go. However, there is no law that compels you to do so. Where can I find bail fine information? Answer: The maximum and minimum penalties for convictions of California laws are set by the Legislature. The penalties for Fish and Game violations are published in the Fish and Game Code starting with section 12000. The Fish and Game Code is available online at http://dfg.ca.gov/enforcement/. This entry was posted in Fines/Penalties/Citations, Fishing, Regulations, Wildlife Encounters and tagged animal behavior, crab fishing, crustaceans, Deer, public safety, regulations. Bookmark the permalink.